Some Data East, Sega, and late-model Stern pinball games may have shipped from the factory with TWO 2MB ROM chips used on the display unit. Updates to display ROM software may be available on ONE 4MB ROM chip, rather than TWO 2MB chips. When replacing an original TWO-CHIP 2MB ROM SET with ONE 4MB ROM chip, you must remove the jumper at location R11 on the display unit PC board, otherwise the replacement chip will not work. 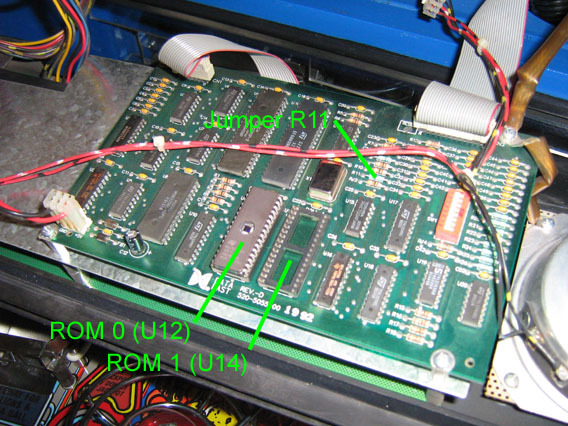 Boards with part # 520-5055-00 shipped with jumper R11 in place, and were set up to use two 2MB ROM chips in locations ROM 0 (U12), and ROM 1 (U14). Likewise, when replacing ONE 4MB ROM chip with TWO 2MB ROM chips, you must install a jumper at location R11, otherwise the replacement chips will not work. Boards with part # 520-5055-01 shipped with jumper R11 absent, and were set up to use one 4MB ROM chip in location ROM 0 (U12), and no ROM chip in location ROM 1 (U14). For more details, see Data East Service Bulletin 38B. For more details on jumpers and replacing/installing them, see our related Tech Article on Williams games by clicking here. Programming your own? When combining the data from both chips into a single chip, data from ROM 1 (U14) is written into the lower half of memory in the single chip, and data from ROM 0 (U12) is written into the upper half of memory.